Scotland’s economy would be £12.7bn a year worse off under a so-called hard Brexit, according to analysis by the Scottish government. The UK government insists it is seeking a Brexit deal that will work for the whole of the UK. And the Scottish Conservatives dismissed the analysis as “completely over-the-top scaremongering”. 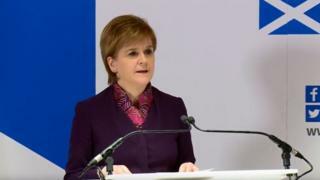 Scottish First Minister Nicola Sturgeon launched the paper with a speech in Edinburgh, alongside her Brexit minister Mike Russell. She said none of the options included was “as good as staying in the European Union”, but said retaining single market membership would be the “least damaging” approach. The Scottish government document, titled Scotland’s Place in Europe: People, Jobs and Investment, considers three potential outcomes for Scotland’s economy when Britain exits the EU in March 2019. They include the impact of Scotland remaining within the single market and customs union or the UK securing a free trade agreement. The final scenario considered is the impact on Scotland’s GDP figures if trade with the EU reverts to so-called WTO (World Trade Organisation) terms. That would involve the UK accepting tariffs on goods imported from, or exported to, the single market. The Scottish government concludes that if the UK was to pursue a WTO relationship, the cost to Scotland would be about 8.5% of GDP. That would be equivalent to £12.7bn a year by the year 2030, compared with current full EU membership, their analysis found. The paper says that would equate to a loss of about £2,300 per year for each person in Scotland. If the UK achieves a free trade deal similar to that the EU struck with Canada – the only model Ms Sturgeon said was likely if Theresa May’s government sticks to its current red lines – Scottish GDP would be 6.1% worse off by 2030, compared with the baseline of EU membership. This would equate to £9bn in 2016 cash terms, or £1,610 per person. The paper estimates that retaining single market membership, which Mr Russell described as the “least worst” option, would see Scottish GDP 2.7% worse off come 2030, working out at £4bn in cash terms, or £688 per person. Ms Sturgeon said single market membership would be “the number one priority” for the Scottish government when phase two of the Brexit talks begin, urging Mrs May not to repeat the “mistakes” of previous talks. The first minister also called on Labour leader Jeremy Corbyn to change his “ridiculous” position on Brexit and join other opposition groups in pushing for single market membership. The Scottish government has also argued strongly in favour of free movement of people, something Mr Russell said Scotland “cannot do without”. Scottish Secretary David Mundell said the UK government was “committed to working closely with the Scottish government as we negotiate our future relationship with the EU” – but was critical of the analysis paper. He said: “These figures fail to acknowledge that above all we need to avoid anything that might fracture the vital UK internal market, which is worth around £48bn to the Scottish economy – or four times more than trade with the EU. “They also do not recognise that we’re seeking a new deep and special economic partnership with the EU that works for Scotland, and indeed the whole of the UK, and is of greater scope than any existing agreement. Scottish Conservative constitution spokesman Adam Tomkins, meanwhile, accused the Scottish government of “scaremongering”, saying the SNP had proved with their 2014 white paper on independence that “their financial forecasts simply cannot be trusted”. Scottish Labour said the Tories’ “reckless and incompetent Brexit” risked “devastating our economy, jobs and public services”, and that the UK government had so far “delivered nothing but uncertainty and attacks on hard-won workers’ rights and devolution”. However, the Scottish Greens said it was actually Labour who were under pressure, saying it was “disappointing” to see them “refusing to join us” in arguing for single market membership “and instead essentially choosing to back the Tories’ job-destroying hard Brexit”. The Lib Dems also urged Labour to “come on board and protect our UK and Scottish economies”. While backing the paper as “worthwhile”, leader Willie Rennie urged the SNP to “drop the threat of an independence referendum”.